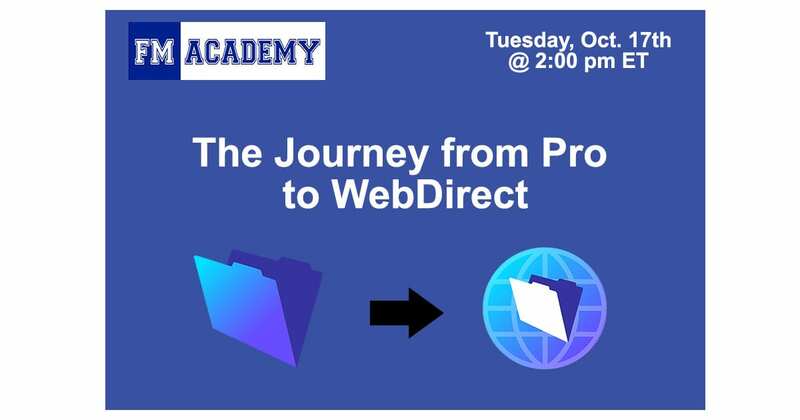 Join FM Academy, and Jerry Salem from IT Solutions for a live webinar: The Journey from Pro to WebDirect: Readying Your Pro Solution for a Smooth WebDirect Experience. In this webinar, we’ll share real-world experiences in readying solutions for WebDirect delivery. We’ll review supported and unsupported features; differences in the two user experiences – some things you expect, others you might not; and we’ll show a few examples of WebDirect solutions versus their Pro counterparts. Tuesday, October 17th | 2:00 pm ET | Register Now!